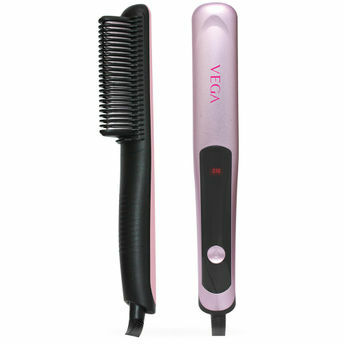 Get silky, smooth and sleek hair with the innovative X-Sleek Straightening Comb from Vega. An adventurous combination of hair straightener and hair comb, this new generation comb makes straightening an effortless experience. This sleek electric tool has a V-shaped comb teeth which glide easily through your hair and straightens a large section of hair thoroughly and evenly. It has three temperature settings 170C 190C and 210C which allows you to hold the comb at an angle for the best straightening effect without tangling the cord. About the Brand: India's leader in the beauty accessories category, Vega offers premium quality products that are suitable for Indian consumers. The main objective of the company is to provide a wide range of innovative and affordable beauty accessory tools for head-to-toe grooming to the Indian consumers. With its affordable range of beauty accessories, you can look prim and proper without burning a hole in your pocket. Name of Mfg / Importer / Brand: VEGA INDUSTRIES PVT LTD.